Introducing new for 2019-2020 School Year, "Wrap Around" Extended Day Care for Preschool. Wrap Around Care Services for PS and PK will be offered students enrolled in one of our Early Learning Programs 2019-2020. Care will be available from 7:00 a.m -6:00 p.m. following the SBS school calendar. Costs include all meals and snacks. PS 3’s and 4’s = $35/day (as needed) in addition to tuition and fees. PK = $22.50 /day (as needed) in addition to tuition and fees. As long as your child is enrolled in one of our programs, any "off" day he or she is allowed to take advantage of the day care as well. The preschool and pre-k daycare will be it's own entity where they will be in a environment designed for their age level. 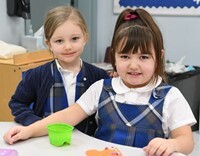 St. Barnabas School currently offers an Extended Day program for all other students enrolled in Pre-K through 8th grade. The program operates Monday through Friday, throughout the school year, and continues through the summer break. The program is led by certified teachers and aides who provide individual care and attention, as well as security and supervision to all children in attendance. Staff members work together to help each child grow in maturity and self-respect, as well as to maintain an atmosphere wherein respect and understanding for others are realized. Extended Day is an excellent opportunity for students to complete homework, interact through recreation and enrichment activities, and play outside. It serves our working families and is also a great way to get to know students from other grade levels. The program operates along with and follows the school calendar. The program is closed on early dismissal days, school holidays, staff development days, inclement weather days and school conference days. The program adheres to all school policies, procedures and rules of the St. Barnabas School Handbook. Extended Day fees are in addition to the regular school tuition and solely support the program. This program is not subsidized by the School or Parish. Teachers and aides can be reached via the Extended Day direct line at (330) 888-2801. For reference, the St. Barnabas Tax ID: #34-0847748. 5:00 pm - 6:00 pm: free exploration, organized activities, crafts, etc. The Extended Day after-school schedule provides an opportunity for students to complete their homework. Please keep in mind that staff members are not aware of the homework assignments for each student, so it is the student’s responsibility to acknowledge the homework assigned and use the resources available to complete assignments. In order to enroll, each family needs to complete the Extended Day Registration & Emergency Contacts Form and return it to the school office. There is a $30 annual enrollment fee per family to enroll in Extended Day each school year. $1.00 per minute fee will be charged for late pick up after 6:00 pm. If you anticipate a late pick up, please call the Staff at (330) 888-2801. All fees (annual enrollment and hourly charges) are billed through FACTS. Please visit the Forms section if you need to complete and submit additional medical forms to the Extended Day Staff for your child.